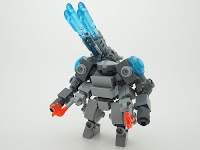 Taking a random troll through the Lego Flickr group I've noticed these creations. WaLE drone by Yappen All Day Long. It's full of weird angles and protuberances. 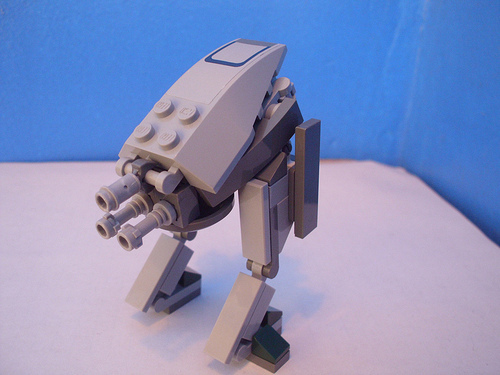 Random Mech Thingy by ISwiperGoSnipin. 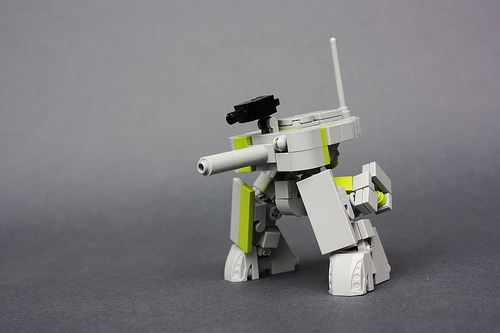 This one looks to have a few Brickarms parts included in the build. 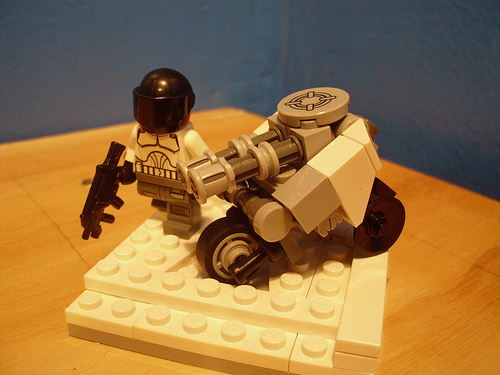 The Q-R270 by The Extra Brick. I found this in the Micro Military group. The photograph is a little dark though. This one by Justin Pern is brilliant! I may have to build a copy. Unfortunately he doesn't allow downloads. So your going to have to trust me and click on through. This blog by XGundam05 has been showing some interesting activity of late. Check it out. Thanks to Thaddeus for the heads up on this one. As I mentioned previously I built a Chub from Kre-O and Lego parts. 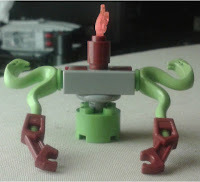 I did this the day after I built the "hybrid" Crab Mech. I used +David Bradford's set up for the hips on this one as I don't have enough Taps in Light Bley. I think it turned out pretty well. Here is a picture showing what Lego pieces I used. If I pick up another Transformers set, I can replace the chest piece and the piece the head clips to with Kre-O. 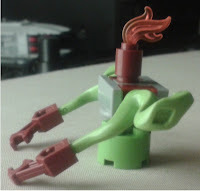 Now I was tired and hungry after class that night so it seemed as if the I had to fight to get the Kre-O parts in place. 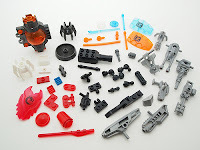 After a couple of days, a clear head and full stomach, I think I'm going to have to agree with +Malcolm Craig that Kre-O parts just don't have the same clutch as Lego parts. Even though they say they're compatible. If you look closely at the clips holding the legs to the hips you can see the difference in diameters between the two company's parts. I broke two Clip Tiles because the pieces I'm using as swords were just slightly too large and did damage over time. 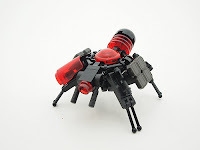 Here's the rest of the pictures in the Brickshelf gallery. 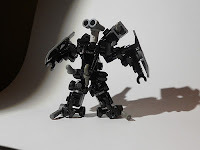 I've decided to hop on the non-Lego parts bandwagon by building one of my Crab Mechs with a combination Kre-O and Lego parts. The set I decided to buy is Ocean Attack from the Battleship line. 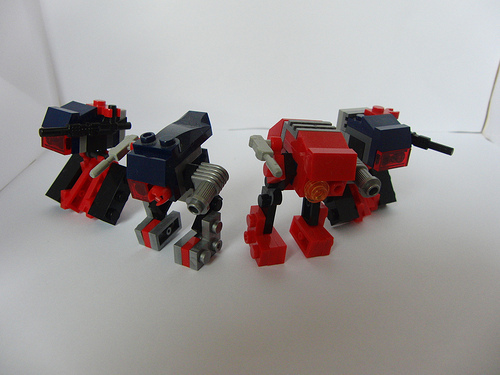 It has a number of printed parts that are similar to the parts I normally use for the legs on Crab Mechs. I picked up two sets for $3.50 each at Walmart. Well, I thought they were printed parts and they turned out to be stickers. The color of the parts on the box differed from the color in real life as well. Here you can see the two packages the parts came in. This is the fully assembled frame. Here's the Brickshelf gallery. I'm not too thrilled with the outcome. Although it's more from lack of parts in the proper colors than anything else. I ended up running to five separate colors instead of the three I would have preferred.﻿ This is also the first time I've used stickers in a build. I think they'd look better on a lighter color brick. Which is more temptation to get more of these sets. 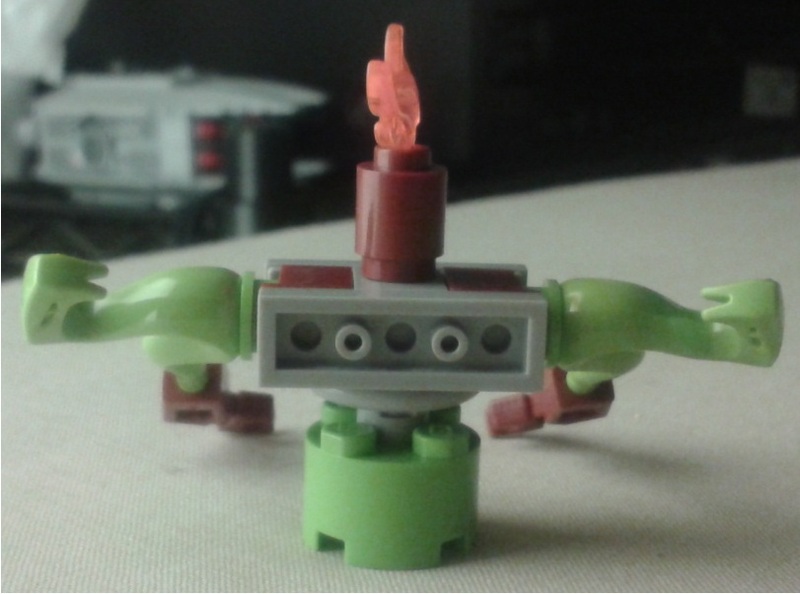 I also built a Chub from a mix of some of the remaining parts and Lego parts. That'll be another post. This blog post was pointed out to me on January 18th by +Nick May. Brickset posted an article about it on January 21st. There is some good discussion going on there. 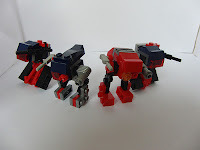 Andrew Sielen has written a post on his blog looking at the current price of Lego and comparing that to the Lego prices of the past. He comes to a few interesting conclusions. There's something about this article that bothers me. I can't figure out what it is though. I'm sure that he's correct in general that Lego prices on average haven't gone up and that it's age/reporting bias that makes us think so. But I think his conclusion that licensed sets are no more expensive than regular sets is wrong.﻿ I suspect it may come from the inclusion of the Ultimate Collector sets in with the regular sets. Even though they're licensed sets, they're not part of the regular line and the low PpP (Price per Piece) helps to drive the average down equal to the non-licensed sets. Someone on the G+ MFZ Community asked about videos for MFZ, so I did some digging. Captain's Challenge Day 4 -- I've posted this before in my Community section. Last but not least. A video about terrain for MFZ. That seems to be about all there is. 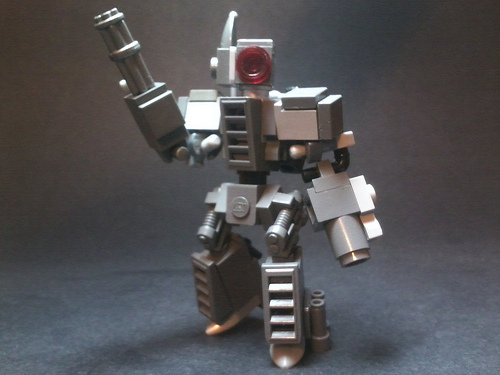 Thanks to +Bryan Rombough over on G+ and The Brothers Brick, we now know that Zizy has a Flickr stream! We continue with the use of non-Lego parts in MFZ builds. LowestFormofWit is back at it again. 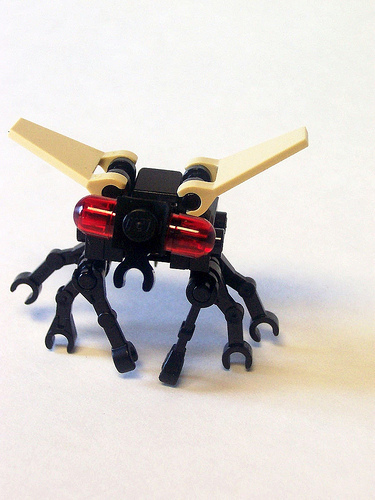 Tablescrap Bug. And again. ST-28I F-type "Seraph" - Paladin variant. Milt69466 continues as well. Little Dragons Company. These are two older ones from LowestFormofWit. Here's a shot of several of the parts used by LFoW. After seeing a few KREO sets on the clearance shelves at a few retail stores I've honestly thought about jumping on this bandwagon myself. The original "Purity" post can be found here. The Penny Arcade Effect is an observable phenomenon. It happens whenever Tycho mentions MFZ on his blog/comments page. Such as here, here, or here. The last mention led to 1,374 views of my blog in one day. By way of comparison, for the seven days prior I was averaging 204 views per day. Here are a few pictures to give you an idea what that's like. The first shot shows the views from 8am Thursday to 7am Friday. This shot shows views from that week. This shot is from a few days later. This shot shows a more granular view of that week. This shot shows, quite clearly, the three peaks from the three different mentions of MFZ on Penny Arcade. So, looking at the screen caps, you can see the spikes from the increased viewership caused by the simple mention of Mobile Frame Zero on Penny Arcade. 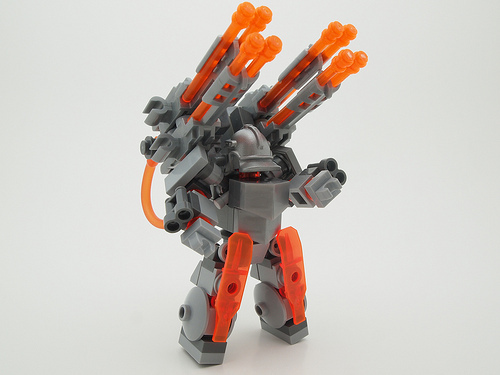 One of the most asked for things, besides the actual rules, is the list of parts in the MFZ Garage kit. For those that don't know, this is a kit that allows you to build five mechs from one of the three factions in the game. So you can see why people might want to know the exact composition of this kit. I've finally added the list as a permanent page here on the Mobile Frame Garage. Enjoy. This is what I was working on over the Christmas break. Dear god, that title is soooo wrong. Anyway. 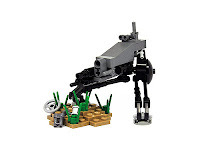 Brickset has released a list of some of the new polybags for 2013. 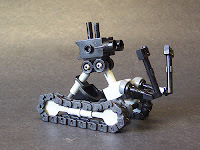 Some of them are not really interesting for us but, there are a bunch that could come in handy for the MFZ community. These are good, but not great. They'll help build up a stockpile of parts. In this post I talked about seeing the Ruler in action for the first time. Back on Christmas Eve I got to actually use one for the first time myself. Sometime between here and here I figured out that I could make a Ruler out of Hinge Plates -- which I have quite a few of -- and 1x4 Plates instead of Hinge Bricks. I did replace the last two sets of plates with 2 Yellow Hinge bricks -- the rest of the Ruler was Light Blay -- to represent a movement of 7 or 8. As the table we were using was 36"x36" we decided that Direct Fire range would be 9". This translated into six sections of the Ruler. This meant that a mech in the middle of the table could cover a circle 18" across. It also meant that a mech at the edge of Direct Fire range could cover the entire distance with a roll of 6 on a Green D6. You can see the Ruler in the above picture, in the lower right-hand corner. The only real change between using a tape measure and the Ruler is that you were moving 1.5" per unit instead of 1". It made movement across the table a little quicker. There weren't any truly massive jumps but, I think there was a roll of 7 -- by a mech with a Green D8 -- at some point during the game. I'll probably continue using the Ruler. There seems no reason to switch back to tape measures especially as I've figured out how to make them from parts I have in large quantities. No, wait, don't. Because Mobile Frame Zero is finally on it's way to being printed! Here's the Kickstarter update announcement. 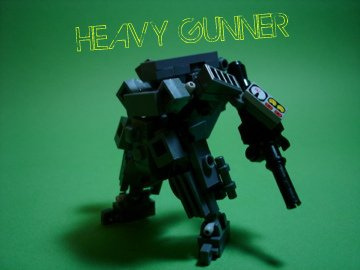 Pre-order or download at the MFZ home page. 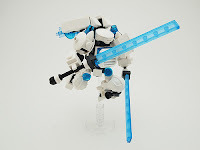 To commemorate the soon-to-be release, the MFZ Flickr group is holding a contest. Maybe now we'll see an uptick in activity in the community. Since the last post was such a hit, I've decided to do another. E-bot by monsterbrick. 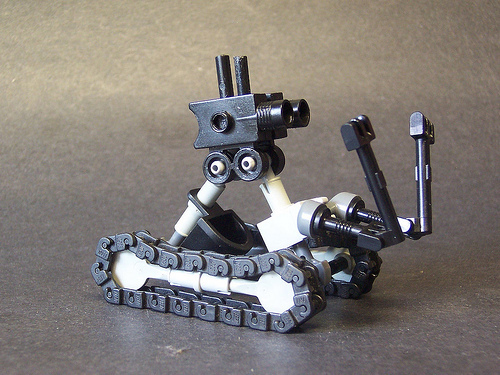 This is a very neat non-bipedal design. Scouts by webbplats. Ignore the mini-fig. The drone/motorcycle combo is what you should be looking at. Walker by webbplats. I know it's a chicken walker, but this one looks pretty neat. Teeny_VT by m_o_n_k_e_y. Nice use of color for highlights. Apoca Mech by mecharonn. Aparently this has a stand that has been photoshopped out. Fly on the Wall by monsterbrick. This one's great. Looks like it would fit right in with my Spider mechs.